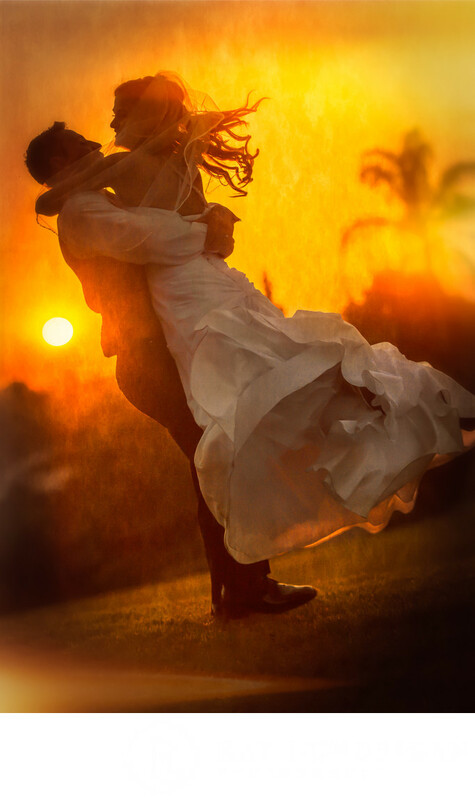 This is an image of Matt and Laura dancing and spinning right at sundown just following their Wedding Ceremony. This was a complete candid moment that was shot with a Canon 5D Mark III and a 200mm, f/2.8 lens while their wedding guests were having dinner. The couple had apparently snuck off to be alone for a few minutes and were not at all concerned about what was happening at their reception during those few moments. They were about 200 feet away from the party on the top of a grassy hill that overlooked some homes that are near the venue. None of the guests seemed to notice and the newlyweds were definitely in their own world as they didn't seem to care about anything except being in that moment. When I presented this image to them they had no recollection of anyone being near them while they were wrapped up in each other and were truly surprised that this moment existed photographically. This moment occurred right before the speeches and toasts and only lasted about two to three minutes. I was photographing family members at heir tables when I glanced over and saw this gorgeous moment unfolding and all I had time to do was to turn and fire off a couple of frames in the hopes that they would continue to spin. I would say that they only spun around three times before they stopped and casually walked back to their bridal table. This image was captured in November of 2012 and still remains to be in my top ten favorite moments I have ever captured. I am glad that this was not a planned out moment as I would have probably opted to use a little fill flash but ultimately I am extremely satisfied that this was an unplanned shot. The Muckenthaler Mansion is pretty much an outdoor Wedding, Concert and Art venue in Fullerton, California. I have shot at this venue a few times and although it is not a high-end establishment, it does provide a very nice, middle-of-the-road ambiance where some really nice photographs can be made. One last thing about this image... It was featured in one of the first issues of Shutter Magazine in the Inspirations section - something I am very proud of. The specifics of this shot are as follows: it was shot at 1/8000 speed with an aperture of 3.2, ISO 800. I was using Aperture Priority with a +2/3 exposure compensation. The focal length was at 100mm. Although I was living in California at the time of this event, I am now living in Vancouver, Washington and starting my wedding photography business up here. 1/8000; f/3.2; ISO 800; 100.0 mm.